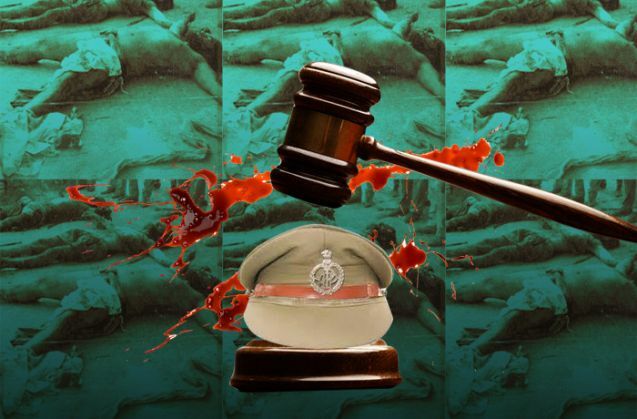 #Pilibhit: 25 years after killing 10 Sikh men in cold blood, 47 UP policemen are convicted. Justice? Nearly 25 years after 10 Sikh men were killed in Pilibhit, Uttar Pradesh, a CBI court, on 1 April, found 47 policemen guilty of the crime. While 20 of the policemen have been sent in judicial custody, the other 27 are absconding. Non-bailable arrest warrants have been issued against them. The sentencing is scheduled for 4 April. In all, 57 policemen had been charged with the killings, but 10 of them died during the course of the trial. In his order, the CBI court judge Lallu Singh described the crime thus: on 12 July 1991, the policemen stopped a bus bringing back 25 Sikh pilgrims from Nanakmatta, now in Uttarakhand, near Kachlapul Ghat. They picked out 10 men from the group, and took them away in a blue bus. After driving them around the whole day, the policemen divided the men into three groups of four, four and two. They were taken to forests under the jurisdictions of three different police stations - Phagunaighat forest in Bilsanda, Dhamela Kuan in Neuriya, and Pattabojhi in Puranpur - and shot dead. According to the CBI counsel SC Jaiswal, the UP police probed the killings initially, only to close the case after a few months. It was then that the lawyer RS Sodhi filed a PIL in the Supreme Court, which handed over the inquiry to the CBI on 15 May 1992. Reacting to the verdict, Pilibhit's veteran politician VM Singh - formerly with the Congress, the Samajwadi Party and the Janata Dal -- thanked God "that these things were coming to light". He recalled that Kalyan Singh, the then chief minister, had defended the police action and branded the youth as terrorists. "Even Prakash Singh, who was the director general of police, had justified the police action," he added. Prakash Singh though claimed he had taken over as the DGP 10 days after the killings. VM Singh also recalled that in the early 1990s, nine alleged Sikh militants were killed in a jail in Pilibhit after they had surrendered. "It's one example of police atrocities in those days", he said, alleging that the atrocities were only increasing. The UP chapter of the Shiromani Akali Dal thanked the court and the CBI "for the verdict and the honest investigation". "Twenty five years is a long time but I thank them all for bringing the culprits to book," said the party's state chief Kuldeep Singh. He added that he would "now urge the Uttar Pradesh government to pay compensation to the bereaved families".